We deeply regret the pun in the headline of this post, and we’d like to take a moment to apologize to our readers. We’re definitely not sorry about sharing this fantastic deal with you though, and you’ll have to hurry if you want to take advantage of it. 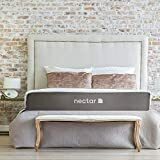 Today, for one day only, Amazon is offering deep discounts on popular Nectar Gel Memory Foam Mattresses. You can get a Twin for just $279, a Queen for $489, and a King for only $559. You only have until the end of the day on Monday to get these great prices though, so you had better get a move on.